LONDON - On my way through London to catch a flight, this relatively new criminologist wanted to stay longer and speak to more people. While I wasn't there for long enough to fully gauge the breadth of the aftermath of violence, the image I had vividly portrayed through friends and colleagues living in the various boroughs of London pictured a scene of decentralized chaos lacking any emotion of hate or frustration -- more so anger. Pure, unadulterated anger. The use of technology has been a focal point throughout these riots -- with social media being blamed for inciting violence, and BlackBerry Messenger as a conduit for the perpetuation of the ongoing riots. "Politicians and the public have no idea why this is happening", former mayor of London, Ken Livingstone, said yesterday. What is clear, however, is that technology has played a crucial part in these riots -- on both polar opposites of the spectrum. As I write this, over 24 hours later, the riots in London have calmed and fizzled out. The cancer of anger has spread, however, through the veins of Britain's infrastructure to other major cities -- Birmingham, Bristol, Nottingham and Manchester. A peaceful protest precipitated the first riot in Tottenham in north London, but it was not to blame. It's not entirely clear what sparked the first riot, but a number of factors caused the riots to spread. Social media has since been used to some extent, raking in Twitter and Facebook to help law enforcement deal with the ongoing crisis. But as many initially reported the use of social media's involvements in the initial unrest, many have been confused between social media and mobile technology. Social media has been used as a force for good -- see below -- primarily as a source for news and ongoing information. But as Twitter, as the primary example, is ultimately propagated by ordinary people, rumors begin and unverified information can spread in a viral way. This is one of many reasons why governments want to track social media communications. It wasn't just Facebook or Twitter or any other social media platform that was being used to perpetuate violence across the United Kingdom. It was BlackBerry Messenger -- widely considered to be secure, encrypted and free to use. But it is not Research in Motion's fault that BlackBerry Messenger was used. Nor is it the fault of Facebook, Twitter or the inventor of text messaging. RIM said yesterday that it would help the authorities wherever possible, by helping police by decrypting messages when warrants were served. The BlackBerry blog was hacked shortly afterwards in protest at RIM's call for help. 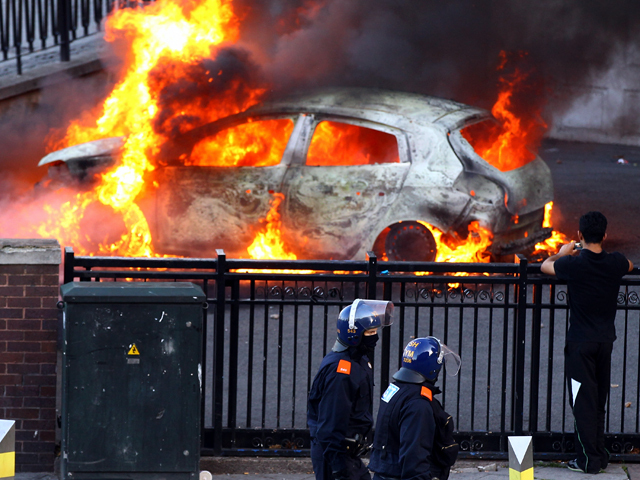 One of the UK's intelligence services, GCHQ, is reportedly currently working to trace rioters involved in the civil unrest. Flickr is being used by Scotland Yard to identify suspects. By uploading images to the image hosting site, police are hoping that the wider community will be able to identify those involved in the unrest. But could Facebook get involved? Facebook, like RIM and Twitter, has a UK base, meaning that the California-based company must also follow UK law. If law enforcement ask Facebook to hand over data of users -- as they have done before, according to Wikileaks founder Julian Assange, then even more technology companies are at the whim of UK law enforcement. Many are naive to the traceability of communications. Twitter users, along with Facebook and BlackBerry Messenger users, could easily blow the whistle on messages seen and personally received, making the risk that those responsible for violence could be caught. Some report that citizen cameras have captured more images of looters than the police themselves. The cleanup operation: the force for good in citizen-inspired sweeping. Despite the social networking being blamed for helping the organization of riots -- remembering that these tools are impartial, and it is the person using them in the wrong -- Facebook and Twitter were used to organize the clean-up operation after nights of rioting. Loosely organised off the foot of the previous night's rioting, many took to the streets after seeing a Facebook group or retweet with gloves, garbage sacks and brooms to help in the effort to clean up their streets. While social media can be loosely 'blamed' for rioting -- whether or not it did, it can be attributed to the clean-up operation, organized by ordinary citizens with an extraordinary passion for the city they live in. Twitter will not remove the accounts of rioters: cites 'freedom of speech'. The microblogging site is not only filled with those condemning the violence and reporting outbreaks of sporadic looting and disorder, but is also being used by those to gloat about their own criminal activity. But Twitter, in style true to its company ethos, will not close the accounts of those using the site in such a way. Facing criticism over this decision, Twitter insisted, resonating much the same feeling written in a previous blog post, that tweets must flow. Social networking fanning London's flames?